Some tactics to get you to go vegan can be cloying or altogether horrifying. Farm Sanctuary's new 30-second ad is neither. The stop-motion animation video, developed by One/x agency, is actually kind of cute. 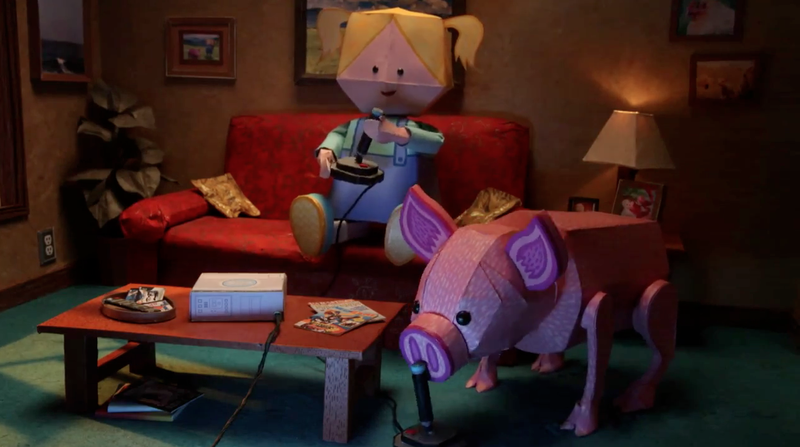 By pointing out that a pig can beat a chimp and a toddler at joystick video games (and still charm the toddler by sweetly staring and wagging its curly tail), the ad aims to show that pigs are more than one-dimensional beings. That's brought home with the tagline (a variation on the rehabbing sharks' line in Finding Nemo): "Pigs are friends, not food." We certainly get that Farm Sanctuary is trying to make it harder for people to justify exploiting pigs. If you can see something or someone as emotionally and cognitively complex, it's a lot harder to want to kill them. But they're also arguing against bacon. Bacon.